A change of space will create a change of mind. We've expanded our award-winning team to add full interior remodeling to our portfolio of services. From designing to installing, we can remodel your dream architectural makeover. Interior design and remodeling is a very intimate design experience, as each project is a work of art. We want you to be in charge, and, more importantly, happy with your builder/designer as we move together to create your dreams. To reflect this, we value this artistic dynamic and encourage you to be proactive and in charge of your experience. Click below to get linked to our design look books! Create a wish-list, must-haves, design boards before connecting with a builder/designer. Gathering design features you envision for your space will move you closer to a design brainstorm with our team. Meet with the builder/designer to check for compatibility. You will be working with this person throughout the longevity of your project. An artistic relationship is critical to not only enjoying the finished project, but enjoying the creative process as well. We want you to be happy when we're there and also when we aren't. Your estimate can vary depending upon the project. Since each estimate depends upon a number of factors, we recommend you visit our builder/designer in person at our Showroom. Once we chat about goals for design, budget, and time frame, we will either move forward with an estimate or suggest a design contract. Both are helpful to really develop intricate details, giving you a fuller plan idea of your proposed improvements. Be sure to bring in dimensions, photos, location of access points to area, and additional information of your desired space to help with the estimate. 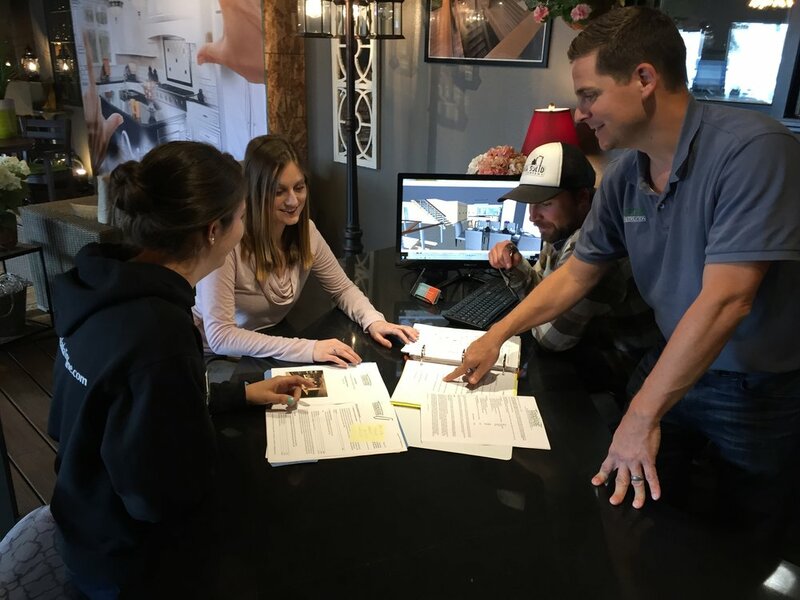 If need, we will recommend a Design Consultation, where one of our builder/designers will meet with you at your home to gather information, photos, and discuss your ideas. This on-site visit is $190 and includes up to two hours of CAD renderings of your existing floor plan, call-outs of proposed changes, and an additional Showroom consultation to go over all details. If you continue in-house, this fee is refundable and included in the construction contract. Interior remodeling requires greater detail and design to provide guarantee that you will love your finished project. When extensive design services are needed, our architectural design team can craft your rendering to your specifications. Our Design Contract Service is $95 per hour with a projected number of hours given to you upfront. If you continue in-house, up to $190 of your initial design fee is refundable.